1/8th Bn, The Worcestershire Regiment, 144th Brigade, 48th Division, B.E.F. William Clarke was the son of Alice Clarke, a painter of 3 West End Cottages, Belmont Road, later Little Buckman’s Cottage, Leigh Sinton Road, Malvern and the late Thomas Edward Clarke. 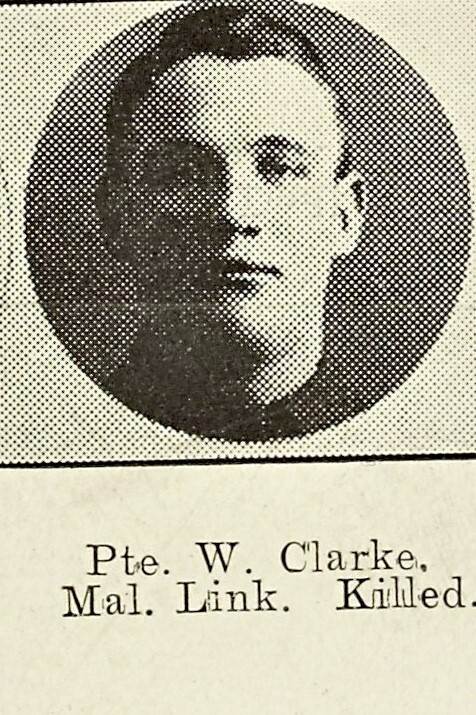 His brother Herbert Clarke was killed in September 1918 with the 2nd Battalion. On 24th April 1917 the 1/8th Battalion attacked Gillemont Farm, an outpost of the Hindenburg Line and suffered heavy casualties. Forced to give ground many men were taken prisoner and the wounded left behind. William Clarke was killed in action during this battle aged just 21. He was buried at Arras Road Cemetery, Roclincourt several miles behind the British lines which indicates that he was probably wounded and died at or on his way to the Casualty Clearing Station.